This 2.5 carat cushion cut cubic zirconia baguette solitaire engagement ring features an 8mm cushion cut square center stone that has 104 sparkling facets along with a single tapered baguette on either side of the center stone. 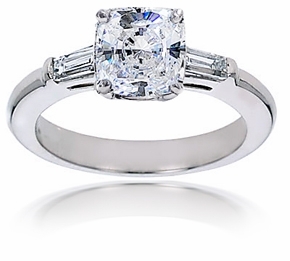 The 2.5 carat cushion cut center stone is set in a classic four prong basket setting and serves as a great engagement style solitaire made of solid 950 Platinum. The Russian formula hand cut and hand polished diamond look stones in this 2.5 carat cushion cut cubic zirconia baguette solitaire engagement ring assure you the finest diamond simulants available and are covered by Ziamond's lifetime warranty.